Having spent the last two years writing and recording between Melbourne and north-western Victoria, the voluptuous, genre-bending first offering from Melbourne electro-acoustic duo Junior Jr. is set for release. Order is a hypnotic blend of live and synthetic ingredients, prepared delicately and boiled in a large pot to form a tasty melodic soup. With the use of field recordings, found sounds, and live instruments, Junior Jr are pushing the boundaries of song-writing, as they serve the listener a delicious feast of eclectic pop-laced fancy. 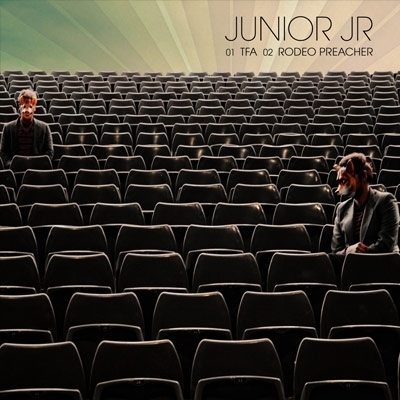 With the release of Order set for February 2010, Junior Jr are presenting two tracks as a succulent entrée to the main dish. TFA — the first tasty morsel, rides a fluent wave of emotive, driving instrumentation skilfully giving way to a rich texture of multi layered vocals. With flavours of Fleetwood Mac, and a distinct aroma of 80’s Australiana, TFA’s steadfast beat forms the base for the subtle movements within, and allows the track to sizzle when the time is right. Rodeo Preacher — the aperitif to wet your appetite, is a rollicking jaunt through 60’s surf culture with its burly guitar lines and pumping electro beat. Best served with Beer-battered prawns and a bleeding steak, this track is bound to take you to the forefront of all things past and leave you craving more from Junior Jr’s Carte du jour.